Hey, it could happen to ANYBODY! Toyota officials now say that the Roush Fenway Racing “proprietary part” Jack Roush claims was found in the possession of a Toyota team was a simple coil spring. Toyota Racing Development President and CEO Jim Aust told ESPN.com's David Newton today that the incident occurred during a post-race teardown involving several cars, and that the part was immediately returned to Roush Fenway Racing when the mistake was discovered. Aust said he does not know how the spring got onto a table filled with Toyota parts, or which team it came from. “It's unfortunate it happened the way it did,” he said. “It wasn't anything intentional. There's no reason (for it) to be done intentional. I have no idea how it happened to begin with." It’s time for Jack Roush to make a decision. Roush’s refusal to disclose the details of this story – including the identity of the team found in possession of the “proprietary part” – does a great disservice to everyone in the Toyota camp. By refusing to name the team in question, Roush tars Michael Waltrip, Bill Davis, Joe Gibbs, Hall Of Fame and Red Bull Racing with the same broad brush. And by refusing to provide the full details of his allegation, he casts a shadow of suspicion over teams that do not deserve to be second-guessed. 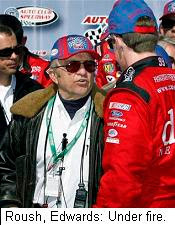 Jack Roush is one of the most respected team owners in NASCAR. His accomplishments – in stock cars, drag racing and road racing alike – make him a living legend in the world of motorsports. But his longstanding vendetta against Toyota, and his apparent willingness to say anything when it comes to the Japanese automaker, have begun to diminish that lofty standing. This is the same Jack Roush who once bragged of paying an employee in Japanese yen, after spotting the man driving a Toyota to work one day. The same Roush who lobbied openly for Toyota’s exclusion from NASCAR, saying the Japanese automaker would spend the sport into oblivion. The same Roush who now accuses someone in the Toyota camp of industrial espionage (if not outright theft), while refusing to provide any of the pertinent details. Amazingly, the man who complains bitterly about being singled-out by NASCAR for sanctions or penalties has no problem slandering the entire Toyota contingent over the alleged actions of just one team. Jack, you’re heading down an ugly road right now, and it’s time for you to either step up, or step back. If – as you claim -- someone in the Toyota camp is guilty of wrongdoing, there are a number of appropriate ways for you to proceed. You can take legal action against the team in question. You can go to NASCAR, requesting that they sanction the involved parties. 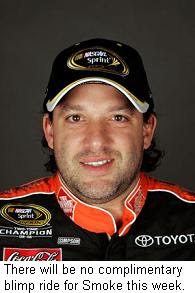 NASCAR spokesman Ramsey Poston said yesterday that he hasn’t heard from you, and knows nothing of this story. You can take your case to the media and expose the involved team; providing all the pertinent details, chapter and verse, to avoid slandering any innocent, uninvolved parties. Or, perhaps, you could have said nothing to begin with. It’s your call. But make no mstake about it, there is no place in NASCAR for the kind of blanket accusation you have leveled against the Toyota teams. It is petty, unnecessary, and patently unfair. You chose to take this story to the media, knowing full well what would follow. Having made that choice, you now have a moral obligation to accuse only those involved, instead of casting a cloud over five car owners and 10 different race teams. You’re better than that, Jack. And they deserve better, as well. Questions continue to swirl around the #49 BAM Racing team, which has been rumored to be merging with either Petty Enterprises or Bill Davis Racing. A partnership with Davis would presumably require BAM to convert from Dodge to Toyota, and there are indications that the team may be doing just that. An announcement was made today that the BAM Racing #49 will carry sponsorship from Microsoft’s U.S. Small Business Team in the remaining races this season. 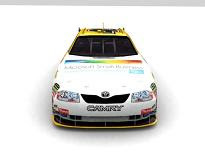 The sponsor’s blogsite features an image of a #49 Toyota Camry, with Microsoft signage. BAM’s entry is still listed as a Dodge on this week’s Martinsville roster, but that could be changed anytime before qualifying on Friday. Interestingly, driver Kenny’s Schrader’s Federated Auto Parts-sponsored NASCAR Craftsman Truck Series entry for Martinsville is also listed as a Toyota. Schrader has traditionally campaigned a Chevrolet in the past. Sauter, however, says he should not be made a scapegoat for the team’s poor performance. “I guess the Miccosukees are under the impression that the driver has the power to turn the organization around, and I respect that opinion," he said. "But to be perfectly honest, J.J. Yeley, Mike Wallace and Johnny Benson are all great drivers who struggled in Phoenix Racing equipment and were replaced. How many drivers do you have to fire before you realize that they're not the problem? " Sterling Marlin replaced Sauter at Nashville Superspeedway last weekend, but is not interested in running the full Nationwide Series schedule. Reno said a search for another driver is under way. Back To Work: Gene Nead has wasted little time finding a new job. Shortly after being released as crewchief for the #21 Little Debbie Ford by Wood Brothers Racing late last week, Nead is returning to Bill Davis Racing to lead the team’s research and development effort, and also help-out at the track on race weekends. 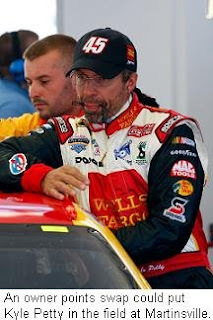 Driver Dave Blaney confirmed Nead’s return during testing yesterday at Caraway Speedway in Asheboro, NC. 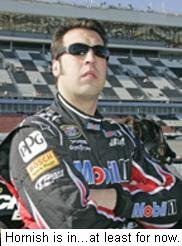 Nead was with BDR before joining the Wood Brothers during the offseason. BREAKING NEWS: Roush Says Toyota Team Found With "Proprietary Part"
ESPN the Magazine has an interesting and potentially explosive quote from Roush Fenway Racing co-owner Jack Roush as part of its 10th Anniversary issue, which is on newsstands this week. If Roush’s allegations prove to be true, this could become NASCAR’s version of the recent spy scandal that rocked Formula One racing, in which the McLaren-Mercedes team was caught with confidential, proprietary test information belonging to rival Ferrari. We contacted Roush Fenway Racing today in search of further information – including team was involved and the specific part in question -- and we hope to have a statement from them later today. 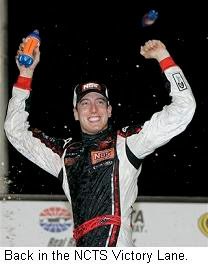 At SceneDaily.com, Kris Johnson posted a blog entry today entitled “Fairytale Finish at Cup Level? Forget About It.” In that piece, he compares NASCAR to the annual "March Madness" NCAA College Basketball tournament, which tips off today. I disagree with Kris’ contention that Bowyer’s New Hampshire win was not an upset. It was. But he’s right when he says that underfinanced teams win infrequently -- if at all -- at the uppermost level of NASCAR. It seems like every NCAA hoop season features at least one March Madness bracket-buster; a team that pulls off a shocker or two on its way to an ignominious exit in the Sweet 16. But you’ve got to go back a long, long way to find a true “underdog winner” of the NCAA tournament. In my opinion, Johnson’s comparison between the NCAA and NASCAR misses the mark. You see, every NASCAR race is an All-Star Race, something that absolutely cannot be said of every NCCA Tournament game. It’s much easier to get pumped-up for next weekend’s race at Martinsville Speedway than it is for the opening round NCAA East Regional matchup between #1 North Carolina and #16 Mount Mt. Mary’s. In my view, rooting for the Mountaineers to knock off the top-ranked Tar Heels is like pulling for John Andretti and the #34 Front Row Motorsports team to win at Martinsville. You hope, you pray, but you don’t really expect. Could Mount St, Mary's upset the top-ranked Heels and advance to the second round? Perhaps, just like Andretti could pull off a Top-10 finish at Martinsville. Neither team has a snowball’s chance of winning the championship when it’s all said and done, though. In my view, winning a single game in the NCAA tournament is akin to finishing in the Top-10 of a single NASCAR Sprint Cup race. Actually winning that race is like cutting down the nets in the NCCA Finals; an impossible feat for anything less than an elite power. With all due respect to Kris Johnson, that’s where the real comparison lies. Officials of Petty Enterprises Racing say they are not anxious to swap owner points between Bobby Labonte and Kyle Petty. But another Labonte – two-time Sprint Cup Series champion Terry Labonte – may be waiting in the wings to help. Petty Enterprises Vice President Robbie Loomis said this week that obligations to sponsor General Mills make a Bobby-for-Kyle swap unlikely. However, he said, "We could call on Terry. He might be willing to help us out a little bit. He's got championship status like…Bill Elliott and Dale Jarrett, so that's an option for us. But ultimately, we'd like to leave Kyle as the driver of the car, and have him make the race." Labonte confirmed that he may be willing to help out, but only on tracks that he enjoys, like road courses and short tracks. “The only way I'd be interested…is if everybody's onboard with it," he said. "'I don't want (Kyle) to think I'm trying to take his job, because the last thing I want is his job. If I could help them, I would." If he takes over the #45 Dodge, Labonte’s status as the 1996 Cup champion would give him precedence over Elliott, who won the crown in 1988. 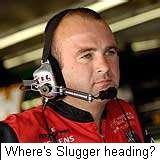 Labbe Out At BDR: A spokesman for Bill Davis Racing confirmed today that crewchief Slugger Labbe has left the team. Labbe had been working with the No. 27 Toyota and driver Jacques Villeneuve, before a lack of sponsorship sidelined the operation. He has been rumored to be under consideration for positions at both Hall Of Fame and Red Bull Racing, but denied contact with either team yesterday. His resume includes crewchiefing stints at Dale Earnhardt Inc., MB2 and Ginn Racing, Robert Yates Racing and Evernham Motorsports. 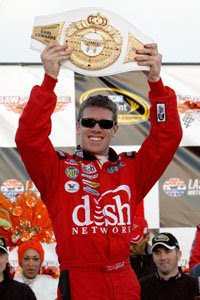 He won the 2003 Daytona 500 with driver Michael Waltrip. Herm Parked, Finds New Ride: The Fitz Motorsports/Shark Energy Drink Nationwide Series team is scaling back its operations, effective immediately. Kenny Wallace drove the car in the first five races of the season, but team owner Armando Fitz said sales of Shark Energy Drink have not been strong enough to fully fund the operation. Fitz said he will put his full effort into his #22 Supercuts Dodge, while Wallace jumps to the #28 Border Patrol Chevrolet for Jay Robinson Racing. Sauter -- "It Stinks": Johnny Sauter says he understands why he was released by the Phoenix Racing Nationwide Series team, but that the move still hurts. Phoenix Racing has not commented on the move, or annoounced a replacement driver. Petty Enterprises will decide this week whether to swap owners' points between Bobby Labonte and Kyle Petty, assuring Petty a spot in the field at Martinsville next weekend. Petty is currently 40th in owners’ points, while Labonte is 18th. Labonte would be guaranteed a position on the Martinsville grid as the 2000 Sprint Cup Series champion. Vice President of Operations Robbie Loomis said no decision has yet been made on whether to request the transfer, and that he might be comfortable with allowing Petty to attempt to qualify on speed at Martinsville. Roush-Fenway Racing is also faced with a possible points-swap, with Jamie McMurray currently 36th in owner’s points, and former series champion Matt Kenseth in 11th. Roush has not commented on the possibility of making such a move. Michael Waltrip Racing has succeeded in dodging the owners’ points bullet, at least for now. All three MWR cars are guaranteed starters at Martinsville, with Michael McDowell’s #00 Toyota ranked 27th in points, Waltrip in 30th and David Reutimann 34th. Sam Hornish, Jr. is the final guaranteed starter for Martinsville with a 35th-place standing in owners’ points, meaning that a much-discussed second swap with former champion Kurt Busch can wait for at least one more race. Busch still has five Past Champions Provisionals left to use. Currently outside the Top-35 and on the “Go-Or-Go-Home” list for Martinsville are Jamie McMurray in 36th, Dave Blaney in 37th, Dario Franchitti, Regan Smith and Petty. It’s one thing to swap points before the start of a season, so long as a team is forced to live with that decision for an entire year. But these midseason point swaps go against the spirit of NASCAR’s Top-35 rule. Deals like the one being discussed between Busch and Hornish – where drivers swap points before the season, then again after the schedule is partially complete -- are especially egregious, and allow team owners to exploit the system in a way that NASCAR almost certainly never intended. If NASCAR chooses to leave this loophole open (and there are many who think they should not) teams should be forced to make an actual, physical change to correspond with the change in ownership. Effective immediately, NASCAR should institute a new clause governing midseason point swaps. Rather than simply shuffling some inter-office paperwork, drivers wishing to swap points at mid-season should be forced to drive the car that is listed for that specific owner. Simply put, require Hornish to steer the Miller Lite Dodge for the remainder of the season, with Kurt Busch inheriting the Mobil One car. Put Kyle Petty behind the wheel of the #43 Cheerios/Betty Crocker Dodge, with Labonte jumping to the #45. That will cause a few headaches for sponsors and marketing departments, but it’s a small price to pay for a ploy that, in effect, gives drivers like Hornish a series of “free passes” to race at NASCAR’s highest level, without ever qualifying. 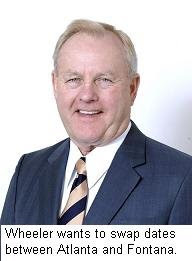 Humpy Wheeler wants Speedway Motorsports, Inc., to swap dates with rival International Speedway Corporation, moving the Labor Day weekend race to Atlanta Motor Speedway, and shuffling Atlanta’s October date to Auto Club Raceway of Southern California. Wheeler says the swap would benefit both venues. “Obviously, NASCAR doesn’t want rainouts, they don’t want bad dates,” he said. “October…is a little bit better weather for (Auto Club Speedway). What we really want to do is try to run Atlanta at night. Everything changes at night. We could run it on Sunday night or Saturday night. It would make all the difference in the world." 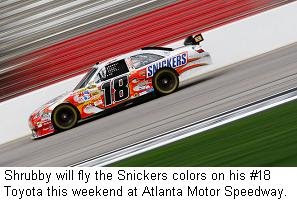 In addition, Wheeler said he would like to move Atlanta’s other race to early June, from its current slot in mid-March. Both Atlanta and California have struggled to sell seats in recent seasons, with weather a frequent issue. Auto Club Speedway battled inclement weather last month, with its Nationwide and Sprint Cup Series races both postponed to Monday by incessant rain. Last weekend’s “Kobalt Tools 500” at Atlanta ran under dry skies, but was preceded by two days of rain, snow and cold temperatures. Both tracks had plenty of empty seats throughout the weekend, with crowds falling far short of NASCAR’s official estimates. NASCAR veteran James Hylton sits down in front of the Sirius Speedway microphones Thursday for an all-new "Sirius Speedway Legends" interview. 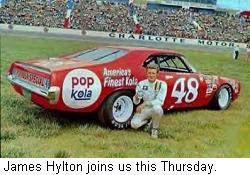 Hylton wasn't the biggest winner in NASCAR history -- just two wins in the Grand National/Cup ranks -- but nobody spanned more eras in the sport, or made more friends along the way. Don't miss this opportunity to spend some quality time with James Harvey Hylton, Thursday at 6 p.m. ET. A day after Tony Stewart chastised Goodyear for what he called its “pathetic” tires at Atlanta Motor Speedway, Jeff Gordon and Ryan Newman say Stewart overreacted. Gordon and Newman joined Greg Biffle in a Goodyear tire test at Darlington Raceway yesterday, and while they agreed that the Atlanta tires were a handful, they said Stewart went too far in his criticism of the tiremaker. Gordon said, "I think he went a little overboard. He kind of made it personal. I don't disagree with him as far as the comfort level in the situation we were in. But we have to look at all sides of this and try to give the folks that are doing their jobs the ability and constructive criticism to try to do it better." Goodyear is contractually obligated to continue supplying tires to every Sprint Cup, Nationwide and Craftsman Truck Series team – even Stewart’s – but some observers are pointing to Toyota's exclusion from yesterday’s Darlington test as a demonstration of the unhappiness with Stewart. Toyota invited three cars to the Darlington test; Gordon’s Chevrolet, Newman’s Dodge, and Greg Biffle’s Ford. 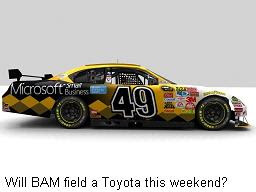 Toyota Sprint Cup program manager Andy Graves said he asked for Toyota to be included in the test, but was rebuffed. Goodyear spokesmen said that only three teams were needed for the test, stressing that the teams were selected prior to Stewart's comments, and that testing invitations are rotated between teams and manufacturers. GEM Denies Sale Of Gordon Team: Gillett-Evernham Motorsports has denied a published report yesterday that had the son of GEM co-owner George Gillett purchasing Robby Gordon Motorsports. In a terse statement released today, Gillett-Evernham said, "On February 1, Gillett Evernham Motorsports and Robby Gordon Motorsports announced a technical, manufacturing and marketing agreement. Nothing has changed since that announcement." Unconfirmed reports Monday had Alex Gillett purchasing the Gordon tea, with plans to operate it separately from GEM, while continuing the technological and marketing partnership. Gordon has not commented on the report. Ratings Up Again: Sunday’s Kobalt Tools 500 at Atlanta Motor Speedway earned a 5.6 overnight rating and a 12 share; Fox's top Atlanta race since 2003, and a 19% increase over last year's 4.7 rating and 10 share. FOX’s rating for the race nearly matched the ratings for ABC, CBS, and NBC combined, and when national ratings are released today or tomorrow, it is likely that FOX will beat the three-network total. For the season to date, NASCAR On FOX is averaging a 5% gain over last year. The big news out of Atlanta Motor Speedway this weekend was obviously Kyle Busch’s first-ever Sprint Cup Series victory for Toyota. But close behind – maybe even neck-and-neck for the lead – was the criticism Goodyear Tire and Rubber Company took from many drivers over the tire compounds they chose to bring to the track this weekend. Just about every Cup team tested tires at Atlanta last October. But Goodyear wasn’t satisfied with the results of that test, and decided to test a different combination in December. The tires that arrived at AMS late last week were a result of the December test, and they caught the vast majority of teams by surprise. The right-side tires were considerably harder than what the teams tested in October, the left-side tires were softer, and just about everyone is unhappy about it. 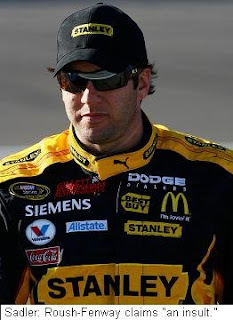 Foremost on the list of dissatisfied customers was Tony Stewart, who lit-up Goodyear yet again yesterday. Stewart called it, “the most pathetic racing tire that I've ever been on in my professional career. (Goodyear) exited out of Formula One. They exited out of IRL. They exited out of World of Outlaws and there is a reason for that. Goodyear can't build a tire that is worth a crap. If I were Goodyear, I would be really embarrassed about what they brought here. I guarantee you Hoosier, or Firestone, or somebody can come in and do a lot better job than what they are doing right now." Jeff Gordon made similar comments, saying, "I felt like I was going to crash every single lap. I'm exhausted right now. I feel like I've run a thousand miles. That was the hardest day I have ever had at Atlanta, especially for a top-five finish. This car, this tire, at this track was just terrible." If Stewart’s comments were overly harsh, Goodyear Marketing Manager Justin Fantozzi went just as far overboard in the other direction, declaring that Goodyear was "tremendously proud of the wear rates we saw here.” He promised that Goodyear will take the data from yesterday’s race back to Akron, Ohio, sit down with engineers, and come up with a plan for the October Atlanta race. He also promised to gather input from drivers before making that decision. Goodyear released a statement just a few moments ago, saying, “We had no tire failures and no problems with heat or wear. We supplied the same tires for both the NASCAR Nationwide Series and NASCAR Sprint Cup Series races, and received zero complaints about our tires after the Nationwide race on Saturday. We accept that drivers will have their own opinions about our tires. If the drivers are not happy, then Goodyear’s not happy. Now that we know how this tire combination performed, we’ll go back and retest for the fall race. There is no doubt that Goodyear often finds itself between a rock and a hard place on tires. Their number-one concern has to be safety, and in virtually every instance, a hard tire is a safe tire. Nobody – most notably Goodyear – wants a replay of the Lowe’s Motor Speedway debacle of a couple of years ago, when right-front tires blew every 8-10 laps, and a number of drivers limped into the Infield Care Center. However, it’s also unreasonable for Goodyear to ask teams to help them test tires, then throw them a curveball like was thrown this weekend. There has to be a spirit of compromise and cooperation, so teams can leave a tire test secure in the knowledge that the tires they just tested – or at least something very similar to what they just tested – will show up again on race day. At present, there seems to be certain degree of stubbornness and arrogance at work on both sides. Drivers seem unwilling to accept anythng less than a perfect tire, and when they don’t get it, spend entirely too much of their time blasting a company that has their safety and well-being at heart. For its part, Goodyear seems far too entrenched in the, “we’re the only option you’ve got, so you’ll just have to live with it” mentality. I have no doubt that if there was a competing tire manufacturer in the Sprint Cup garage, Goodyear would be turning out a much more workable tire than they’re turning out today. I was around for the tire war between Goodyear and Hoosier, and trust me when I tell you that there were no winners. The pendulum swung FAR too far in the direction of speed over safety, and drivers were hurt as a result. I’m not advocating bringing a second manufacturer into the sport. I am, however, urging Goodyear to put their vast resources to work on finding a safe – but still competitive – tire for this new NASCAR racecar ; something that will keep our drivers safe, while also allowing them to put on a competitive race. That should not be too much to ask. Climb Aboard The Shrubby Train! It’s becoming very difficult to ignore Kyle Busch these days. 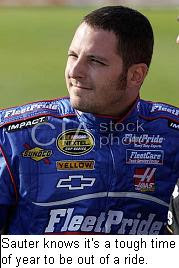 He is the NASCAR Sprint Cup Series point leader, with one pole and two-top five finishes in three starts this season. He steered his new Joe Gibbs Racing/M&Ms Toyota to an outstanding fourth-place finish at Daytona – after leading for much of the day – then finished fourth in California and 11th at Las Vegas. He also leads the NASCAR Craftsman Truck Series standings, after posting his second consecutive series win in last night’s American Commercial Lines 200 at Atlanta. That victory followed a win two weeks ago in California, and a second-place finish in the season opener at Daytona. Let’s do the math. In nine starts to date, Busch has seven top-five finishes, with an average finish of 6.4. He has led more laps than any other driver in NASCAR, and established himself as a legitimate contender to sweep all three major NASCAR championships, should he choose to make the attempt. “I think the possibility is there,” said Busch of the possibility of adding a full Nationwide schedule to his full-time Sprint Cup slate. “But I'm not going to do whatever it takes to get practice in the Nationwide car. I'm going to worry about the Cup stuff and show up to race the Nationwide car." He has said that he will not run the entire Craftsman Truck Series schedule; apparently preferring to win two-thirds of his part-time starts instead. In the past, his free-wheeling style – both on and off the racetrack – have made him an easy target for the grandstand boo-birds. That’s not likely to change overnight, but it’s definitely becoming more difficult to find a seat of the Busch Bandwagon lately. Fans and fellow competitors have begun to recognize a future NASCAR champion in the making, and the lines at his souvenir trailers are now five and six-deep. His ability to manhandle a less-than perfect racecar has been favorably compared to that of the late Tim Richmond; another notable renegade who took time to curry favor with NASCAR Nation. His ability to craft a memorable quote ranks him right up there with Tony Stewart and big brother Kurt on the list of media members’ favorite stops. Much has been made of the off-season swap of Dale Earnhardt, Jr., for Busch at Hendrick Motorsports. The situation came down to much more than “who’s the better driver;” with contract status and marketability also major factors in Rick Hendrick’s decision to make the change. But Hendrick himself admitted that he expects to see Kyle Busch accepting a Sprint Cup championship or three in his career, and we expect Hendrick to be proven correct. In short, the kid’s got it all, and Joe Gibbs must be feeling like the cat that caught the canary. Love him or hate him – and there are still plenty of people on both sides of that fence -- Kyle Busch holds the hottest hand in NASCAR these days. And there are no signs of that changing anytime soon. Toyota Racing Development General Manager Lee White drew a sharp line in the sand this week, scoffing at Jack Roush’s assertion that an errant oil tank cover on Cark Edwards’ winning Office Depot Ford at Las Vegas Motor Speedway was due to nothing more sinister than a bolt that inadvertantly backed off. White said he believes the cover was intentionally allowed to come loose, resulting in approximately 170 extra pounds of downforce and reduced aerodynamic drag. In addition, White said videotape obtained during Sunday’s race shows a crewman pulling on Edwards’ right-rear fender to create a three-inch gap between the fender and filler panel; a gap White claims would produce an additional 70 pounds of downforce. Roush reacted angrily to White’s comments, saying, “I'm going to treat Lee White and Toyota…like they were an ankle-biting Chihuahua, and be done with it.'' The Roush-Fenway co-owner also volunteered to take a lie detector test to prove that there was no intent to cheat. A well-known Sprint Cup Series crewchief -- who spoke on the condition on anonymity -- confirmed that the trick has been well-known in the NASCAR garage for years. In his words, “We all did it for a long time, until NASCAR put a stop to it.” In addition, he said Edwards was “ratted out” by another team in Las Vegas Sunday, and that NASCAR officials “knew exactly what they were looking for” after the race. A number of drivers and crewchiefs say that assertion holds little water. “One thing I have learned about these race cars is typically, things don't fall off," said Jeff Burton. "Crewmembers typically don't leave the a-frames loose, they typically don't leave brakes loose, the gauges don't fall out of them. We have highly trained mechanics that have rigorous checklists. I don't know if they did it on purpose or not, nor do I claim to. Mistakes do happen, though." It now appears unlikely that Roush-Fenway Racing will appeal their penalty to the National Stock Car Racing Commission. But the debate will almost certainly rage on. The love affair between Jack Roush and Toyota continues. The Roush-Fenway Racing co-owner has never been a fan of Toyota, once paying an employee who drove a Toyota passenger car in Yen. He criticized the Japanese automaker’s inclusion in the sport, saying they would sway the competitive balance by spending the competition under the table. Now, the General Manager of Toyota Racing Development has returned fire, saying Carl Edwards' Roush-Fenway team intentionally allowed an oil reservoir cover to come loose during Sunday's race at Las Vegas Motor Speedway, in an attempt to increase downforce and gain speed. Lee White said Toyota wind tunnel testing indicates that removing the oil tank cover produces approximately 170 extra pounds of downforce, giving the car a significant aerodynamic advantage. In addition, White said videotape obtained during Sunday’s race shows a crewman pulling on Edwards’ right-rear fender to create a three-inch gap between the fender and filler panel; a gap White claims would produce an additional 70 pounds of downforce. Roush-Fenway Racing President Geoff Smith insists that the oil tank cover came loose accidentally due to a bolt backing off during the race, and that it did not produce any performance advantage. I have no doubt that Robby Gordon Motorsports did not intentionally mount an unapproved nose on their car at Daytona. An honest mistake by Dodge –sending the offending part instead of the appropriate, NASCAR-approved nose – was compounded by team members who installed it without noticing the difference. It could happen to anyone, especially someone in a rush to complete a full-bore manufacturer swap in just four days. Like they adage says, haste makes waste. No matter what, though, Gordon’s Jim Beam Dodge was not correct when presented for pre-qualifying inspection at Daytona. And someone has to be held accountable for that fact. NASCAR handled the situation exactly has they have in the past, docking Gordon’s team 100 driver and owner points, and suspending crewchief Frank Kerr for six races. They declined to consider intent -- just as they have in every other case of this type over the last two years – displaying the kind of consistency fans say they want from their sanctioning body. Gordon also did all the right things, pleading his case with a perfect mix of apology and indignance. Dodge Motorsports took full blame for the screw-up, tossing around “mea culpas” like rose petals at a high-society wedding. 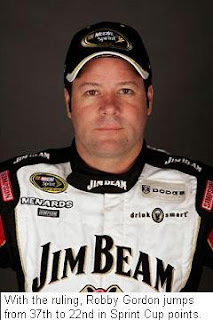 Sponsor Jim Beam mounted an effective public relations campaign on Gordon’s behalf, allowing him to arrive at yesterday’s hearing with armloads of petitions from NASCAR fans pleading for leniency. In the end, the National Stock Car Racing Commission sided with Gordon, eliminating the driver and owner points penalties, and reinstating crewchief Kerr. The commission may have done the right thing for Robby Gordon and his team. They have not, however, done right by the sport as a whole. In the aftermath of yesterday’s ruling, no driver, crewchief or team can ever again be held accountable for illegal or unapproved parts found on their racecar. Effective immediately, “I didn’t mean to” has become an acceptable excuse for any rules-related transgression. A clear precedent has been sent, and it can never be undone. Any driver who speeds on pit road can now invoke the “Whoopsy Daisy Defense,” blaming a minor manufacturer’s flaw in their tachometer for an inaccurate reading. Beginning today, teams are no longer responsible for the parts and pieces bolted onto their cars. The National Stock Car Racing Commission has seen to that. NASCAR has issued penalties and fines to Carl Edwards’ No. 99 Office Depot Ford team as a result of rule infractions found last Sunday at Las Vegas Motor Speedway. The car was found with an improperly attached oil tank reservoir cover, prompting NASCAR to dock Edwards and car owner Jack Roush 100 championship points, respectively. In addition, if the team qualifies for the Chase for the NASCAR Sprint Cup, NASCAR will not award them 10 bonus points for the victory. Crewchief Bob Osborne has been fined $100,000 and suspended from the next six NASCAR Sprint Cup Series events (though April 30th) and placed on probation until Dec. 31st. Our guy "Pepsi Steve" Buhala revamped the paint scheme on his Sirius Speedway-sponsored race team this week, going with an "old school" black/white/gold concept. We think it looks HOT, but Steve's dog Mingo apparently does not agree. 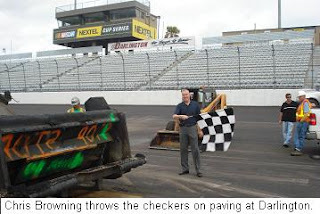 The new asphalt is down at Darlington Raceway. Track President Chris Browning announced today that the job is complete, and that the focus is now on the track’s upcoming Dodge Challenger 500 race weekend on May 8-10. The project began in mid-January, and took nearly 15,000 tons of asphalt to complete. Construction crews used four million reference points around the track to ensure that the banking and corner transitions remained unchanged. The new racing surface was part of a $10 million capital improvement project that included an infield access tunnel large enough to accommodate car haulers, motorhomes and emergency vehicles, and the addition of SAFER barriers on the inside of the straightaways. “The Track Too Tough to Tame” will host a Goodyear tire test on March 10 and 11. Carrot Top Loves The Godfather! Who knew Carrot Top was a NASCAR guy? The funnyman turned to the Godfather for a little "inside info" at Sunday's UAW-Dodge 400 at Las Vegas Motor Speedway. Is The Writing On The Wall For New Hampshire's Second Cup Date? If you’re a season ticket holder at New Hampshire Motor Speedway, now would be an appropriate time to begin worrying in earnest about your track’s annual, two-race slate of NASCAR Sprint Cup Series races. Speedway Motorsports Inc., CEO Bruton Smith sounded an ominous warning for New England race fans Sunday, rallying fan support for a second Cup date at Las Vegas Motor Speedway next season. Smith is a man of substantial means. He is rich enough to have spent $340-million for the Loudon, NH oval last fall; about $100m more than anyone else thought prudent. 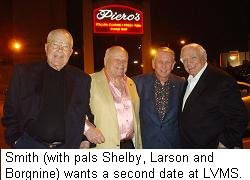 He travels in powerful circles, celebrating his 81st birthday in Las Vegas at an upscale Italian eatery with automotive icon Carroll Shelby, former Open Wheel great Mel Larson and film star Ernest Borgnine. In short, Bruton Smith is a man used to getting what he wants. And Sunday, he made it clear that he wants a second Sprint Cup Series race at Las Vegas Motor Speedway. During pre-race ceremonies for the UAW/Dodge 400, Smith said, “If you want to see two races here next year, hold up two fingers for the world to see. Send a message loud and clear: we want TWO…TWO…TWO.” Fans quickly picked up the chant, apparently believing that they were lobbying NASCAR for a second race. However, NASCAR has repeatedly stated that it will not add anymore dates to the already overcrowded Cup schedule. They have also said that if Smith wants a second race in Las Vegas, all he has to do is transfer an event from one of his other tracks. In short, the decision on a second race at LVMS belongs entirely to Bruton Smith, making Sunday’s “TWO…TWO…TWO” more than a bit puzzling. Smith has the power to make a second race at LVMS happen with little more than the stroke of the pen, and he knows it. Based on that fact, Sunday's chant-fest was little more than table-setting for what comes next; an announcement that due to overwhelming popular demand, Las Vegas Motor Speedway will host two races on the 2009 Sprint Cup schedule. Our sources continue to say that the most likely scenario has New Hampshire losing its Opening Round slot in the 2009 Chase For The Championship, with that event moving to Texas Motor Speedway. Texas’ Chase date – inconveniently located on the opening weekend of deer hunting season in the Lone Star State – would then shift to Las Vegas. There are other scenarios, of course. And the fact that northeast race fans have never failed to sell-out a Sprint Cup race at the Magic Mile (something fans in Texas, Atlanta and Charlotte cannot claim) is a selling point in favor of keeping two races in the Granite State. Like it or not, two things are crystal clear at ths point. First, based on Smith's pre-race comments Sunday, there will be two races in Sin City next year. And second, another Speedway Motorsports, Inc. venue will lose a race to make it happen. That's the simple reality of the situation. And if you're a loyal supporter of New Hampshire Motor Speedway, it's also cause to lose sleep at night.